French President Emmanuel Macron said his government is preparing to take fundamental steps to completely reform the lives and organizational structures of Muslims in the country. 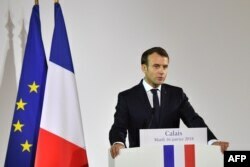 Speaking to Journal du Dimanche, Macron said he wants to bring an end to disputes nationwide triggered by jihadi attacks over the last few years. According to the French president, the reforms that will be initiated in the first quarter of 2018 include the fight against Islamic fundamentalism, restructure Muslim organizations and regulate their relations with the rest of the society. The French government wants to find a nationwide solution to the issue of financing and training Islamic clergy. Paris says other governments meddle in the nation's affairs when they directly finance mosques and appoint imams despite the existing law on secularity. The government is looking for ways to finance mosques, regulate charities, raise funds to train imams and perhaps tax halal products to raise funding. The French government is reportedly working on the reforms through the president’s office, the Ministry of the Interior and the French Council of the Muslim Faith (CFCM) which was set up in 2003 by then-Interior Minister Nicolas Sarkozy. While Elysee Palace is in touch with Islam experts, academics and intellectuals, the ministry works through its own experts. The CFCM’s own report on the proposed reforms will be ready in June. ​While the planned reforms aim to curb foreign influence on mosques and imams in France, it also proposes to require imams to take university-level studies where they will be taught secularism, civil liberties, theology, religious history and sociology. Also among the proposals is the election of a Chief Imam – like the existing Chief Rabbi of France in the case of Jews – to lead the French Muslims as the sole religious and moral authority and a strong communal representative. When Macron received France’s religious leaders in December last year, he reportedly said he wanted Islam (in France) restructured and asked the CFCM to create a working group to contribute to the project. Macron also wants to change the structure of the CFCM, a non-profit whose management is still influenced by leading Muslim countries. The CFCM itself also reportedly backs the proposed reforms. Anouar Kbibech, the vice-chairman of the organization said, there is already an awareness within the organization to reach out to the rest of French society. Ahmet Ogras, the CFCM’s Turkish-French chairman also says the organization has also been pressing for reforms. The leader of the country’s nationalist party, Marine Le Pen rebuffed the project as “unacceptable” and she called on the government to stop financial aid to mosques. However the leader of Front National said she supports the idea of stopping foreign influence on French mosques. A recent survey by Institut Francais de l'Opinion Publique (IFOp) shows 56 percent of the participants agree to Islam and the French society can coexist. In 2016, at the peak of the jihadi attacks in France, that rate was 43 percent.